Spring and summer are finally on the horizon. We have hope that we can finally sit on the deck and eat! To be able to go outside and not freeze is a wonderful feeling when you live someplace that is cold half the year. Sadly…we even think that 40°F is warm. Paul and I had a three seasons deck built onto the house a few years ago, and look forward to warmer weather to be able to sit out there and read (or knit) on the deck. We usually have our meals out there as well. With the warmer weather arriving, we started to pull out some of our more “summery” dishes. This is one I have made quite a few times, and made just last week to celebrate the warmer weather. Preheat oven to 350°F. Cut potatoes into eighths. Put in a large casserole dish. Melt butter and add in the garlic, salt and lemon juice. 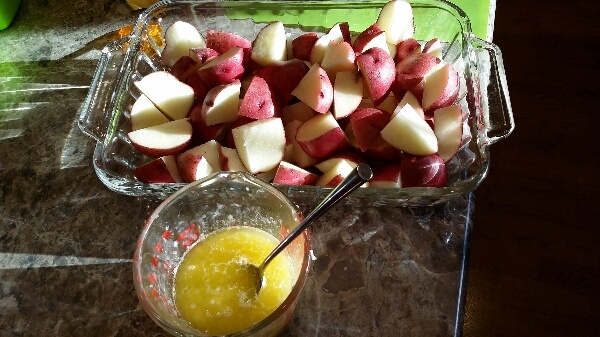 Pour butter mixture over the potatoes. 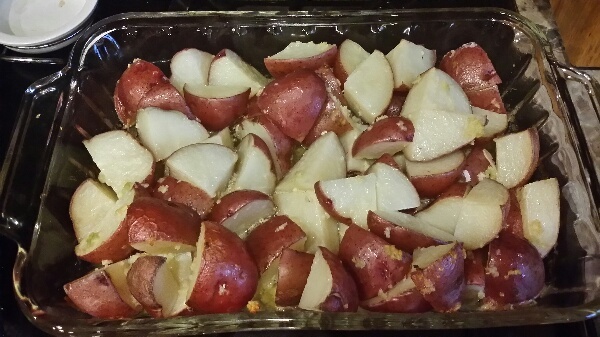 Cover with foil and bake for 30 minutes in preheated oven. Remove the foil and bake for an additional 10 minutes. Adapted from a recipe from allrecipes.com.